When you look back at seasons past, many of the NFL champions had a feeling of inevitability to them. You can remember the greatest of champions putting their stamp on the season as they started to separate from other contenders. The inadequacies that kept them from winning it all before, had seemingly been swept away. Yet when that team runs into a brick wall on the way to what was supposed to be their championship. It becomes the expiration date on their being a legitimate contender and you’re left with…what if??? Enter the 2004 Philadelphia Eagles. 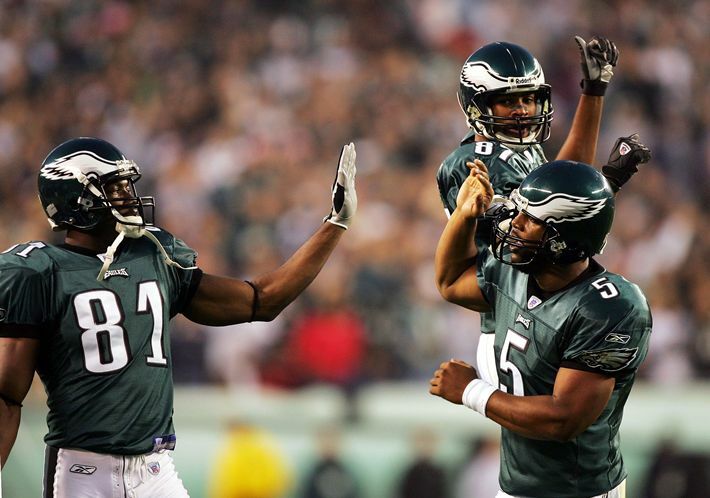 McNabb to Owens made the 2004 Eagles. Head Coach Andy Reid was hired in ’99 from the Green Bay Packers and the Mike Holmgren coaching tree. As Quarterback Coach he oversaw Brett Favre as he accumulated 3 straight NFL MVP trophies, 2 Super Bowl visits, and 1 championship in their final 3 seasons together. By drafting McNabb in year 1 for Reid to develop, the future looked bright. As the 2000’s began, your Philadelphia Eagles were developing a young Donovan McNabb at quarterback. He was the shining member of the quarterback class of 1999, and he had become a dynamic play maker in Head Coach Andy Reid’s “West Coast Offense”. Although he was developing as a passer, he would take off on serpentine runs when plays broke down. They ran the ball by committee at RB and relied on a gambling blitzing defense run by the late Jim Johnson. 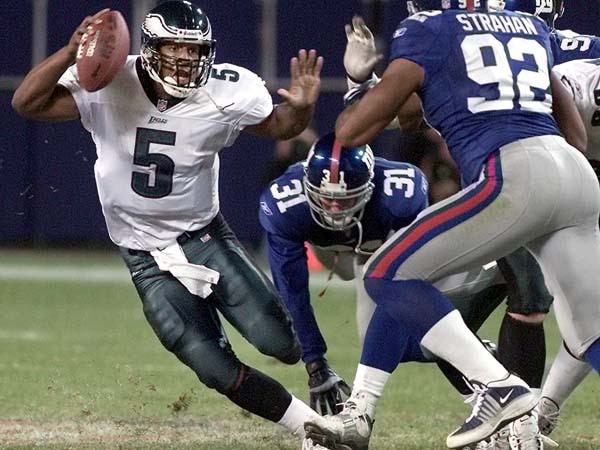 McNabb eludes Michael Strahan in the 2000 divisional playoff. Philadelphia became a wildcard entrant in 2000, where they gained confidence with a 21-3 hammering of the Tampa Bay Buccaneers. The following week they lost a 20-10 slugfest in the divisional round v the Giants. New York went on to play in Super Bowl XXXV and did so based on 3 wins over Philly. So the die was cast, a little improvement and the Eagles could play in the Super Bowl. No one knew beginning with the 2001 NFC Championship a new odyssey would begin. Three consecutive losses in the championship game left the Eagles and the city of Philadelphia mired in despair. They lost a tough game in ’01 to The Greatest Show on Turf St Louis Rams 29-24, although they were underdogs on the road. This was nothing compared to what happened next. The 2002 NFC Championship had the Eagles hosting in the last game ever in Veterans Stadium. A title starved city was raucous in anticipation as the Buccaneers were making the trip to The City of Brotherly Love for a 3rd consecutive postseason. The ’00 Wildcard win established the Eagles as the up and coming team in the NFC and not the Bucs. The ’01 Wildcard solidified the notion and Tampa fired Head Coach Tony Dungy. Ronde Barber sails 95 yards with the game clinching touchdown. The Eagles were planning an NFC Championship coronation with an outdoor trophy presentation. The field was surrounded by police mounted on horseback. One small problem…the Bucs won the game 27-10 thanks to new Coach Jon Gruden’s offense. Tampa was motivated by those previous playoff losses. They went on to win Super Bowl XXXVII 48-21 over Oakland. After another NFC Championship flame-out against Carolina in ’03, and it appeared the Eagles had let their championship window close. Jevon Kearse was one of the league’s best quarterback trackers. 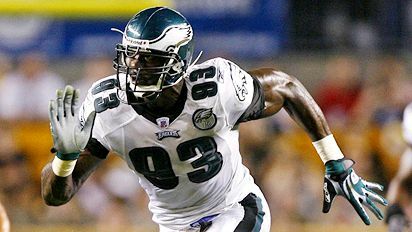 The front office struck a blow in Free agency when they signed DE Jevon Kearse then traded for WR Terrell Owens. These were the two big fish available in the 2004 off-season and Philly nabbed them both. Gone was the attitude the Eagles didn’t need to sign blue chip talent to make it to the Super Bowl. It was all or nothing for 2004. A perennial top 10 defense returned to form after sliding to 20th in the 2003 season. With Kearse (7.5 sacks) the Eagles returned to form as they garnered 45 sacks and 17 ints in 2014. Up from 35 sacks and 13 picks the season before. Defensive Coordinator Jim Johnson didn’t blitz as often with a dominant presence like Kearse in the lineup. McNabb, now with the league’s best receiver in T.O., had the best season of his career. In his previous 3 complete seasons he averaged 57% completion rate, 3,272 yards, 22 TDs and 11 interceptions. In ’04 he completed 64% of his passes for 3,758 yards, 31 touchdowns to just 8 picks. He set several club records and Owens was on his way to when he suffered a fractured ankle in week 15 after a dirty horse collar tackle by Roy Williams in a 12-7 win over Dallas. Before that Owens, and his endzone antics, had shredded the league with 77 receptions for 1,200 yards and 14 scores. He had made a pact with Coach Reid to score 15 TDs and if he did so Reid would have to don a pair of tights. Damn he came close but the real story became what would the 13-3 Eagles do in the upcoming playoffs without their #1 playmaker?? They would have to rely on the receivers from previous years who weren’t thought of as making enough plays to get the Eagles over the top. Freddie Mitchell, Todd Pinkston, and Greg Lewis. It was Mitchell who scored twice in the 24-14 NFC Divisional playoff win over the Minnesota Vikings. Running back Brian Westbrook (1,515 yards from scrimmage) would be relied upon heavily. Although there was speculation T.O. might make it back if the team made it to the Super Bowl. To do so they would have to make it past their albatross… the NFC Championship Game. Leading up to Super Bowl XXXIX, the lead story had been would Terrell Owens play in the title games. With several surgical screws in his ankle, and after signing an injury waiver, he was available on center stage. The Eagles 24-21 loss was a valiant effort. Just 6 weeks after fracturing his ankle, Terrell Owens 9 rec for 122 yards was a sight to behold. They were beaten by the defending champion New England Patriots who were just a step better. McNabb had thrown for over 300 yards but had 3 costly interceptions that were the difference in a close, close Super Bowl. The Eagles were primed to make it back to the big dance in ’05. However the expiration date had come and gone on the Eagles as a personality conflict between T.O. and Donovan McNabb tore at the fabric of the team. Owens would eventually be released for conduct detrimental to the team. After a 3-1 start, the ’05 Eagles fell to a 6-10 record which included a 42-0 road loss to the eventual NFC Champion Seahawks. . The run was over. Andy Reid coached on through the 2012 campaign with several playoff seasons but none where the Eagles were considered elite. McNabb played on through 2009 before leaving for Washington. He was replaced by Michael Vick, the quarterback he beat for the 2004 NFC Championship. Donovan McNabb, Terrell Owens and their … “irreconcilable differences” derailed a promising team and the City of Brotherly Love had to wait another 13 years before capturing a title. Met Reid at the Gold Jacket Dinner in Canton 2018. Eagles Safety Brian Dawkins had received his Gold Jacket earlier. There are many NFL fans who miss true talents around the league and just focus on their team. That narrow focus can keep one from seeing a Hall of Fame talent at work. That doesn’t mean an overlooked player should miss the call to the hall if he doesn’t garner great media attention. It’s about what they accomplished on the field and how well their peers respected their exploits. Dillon was a violent runner. Did you know that at one point Corey Dillon owned the greatest single game rushing performance and the #6 performance in NFL history?? Not Emmitt Smith, Barry Sanders, Eric Dickerson, LaDanian Tomlinson, nor Adrian Peterson or any great back you’ve ever watched accomplished that . Well, you have to be in your mid fifties at least to say you saw someone perform to that high a level. That was when OJ Simpson held sway in the NFL. You’d have to be in your fifties!! Not only that, his 6th place (at the time) performance stood as the NFL’s rookie rushing record at 247 yards in a 1997 game against the Tennessee Oilers. That record Dillon broke had been Jim Brown’s. Each of these have since been broken but it was the manner in which they were set that sets them apart. Unlike the shifty make ’em miss running style of most halfbacks, Dillon struck like the hammer of Thor. He was a passionate violent runner that thrived on contact. Once he positioned a defender to one side, he’d forearm, stiff-arm, or shoulder right through them. He made a joke of arm tackles and if you wanted to tackle him, your heart had better be in it. Dillon’s passion led to frustration as the Bengals piled up losses. For years media pundits painted him with the broad brush of that of a malcontent. Yet let me ask: If you were one of the best talents in the league, how frustrated would you be with a team that couldn’t get you any help?? In 1999 Inside The NFL broadcast their show from Cincinnati asking “Why can’t the Bengals tun it around?? Were they the JV of the NFL? ?” They interviewed player after player and the only one whose eyes burned fire with frustration were Dillon’s. For an instant you could peer into his soul and you understood him completely. For all the hard work to make it to the NFL, then play for a franchise that couldn’t field a better team. He was toiling in anonymity loss after loss. All those childhood dreams of playing in a Super Bowl were dying an agonizing death. 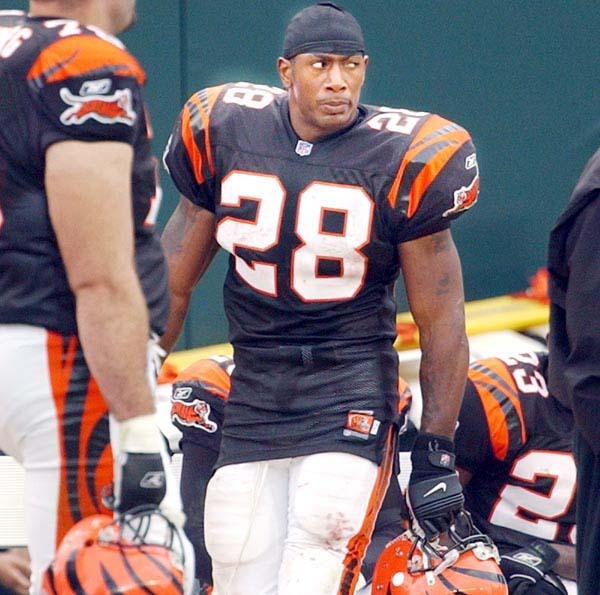 It looked like 2000 would be no different as the Bengals started out 0-6. They had only scored 34 points while being shut out 3 times when the Denver Broncos, just two years removed from back to back championships, came to town. The heavens opened up and the football god’s touched Dillon, allowing his fury to be unleashed in the greatest rushing display in NFL history. However a closer look and Corey lost 6 yds on 6 of his carries. So in essence he ran for 284 yards in 16 carries or 17.75 yards per rush!!! Yikes!!! Best in history by a wide margin… It was Corey who wiped Jim Brown and Walter Payton from the record book, proving to a generation those records weren’t unbreakable. Payton’s record had stood for 23 years. Dillon finished the 2000 season with a team record 1,435 yards rushing. Don’t forget he had two games against the record setting Super Bowl champion Raven’s defense that ranked #2, and two more vs. Tennessee’s ranked at #1. What would he have done had he played in a less stout division defense-wise?? What would he have done behind a line like the Dallas wall with Larry Allen?? In 7 years he only played once with a Pro Bowl lineman. That was T Willie Anderson in 2003. By then he was splitting time with Rudi Johnson. In that same year Chad Johnson (Ocho Cinco) made the Pro Bowl. Other than that he played with NO Pro Bowl players for all that time. In those circumstances he ran for 1,000 yards in 6 of 7 seasons. In stark contrast Emmitt Smith’s line had 16 Pro Bowl Linemen and TEs between 1991-1995 alone. But alas he was traded to the New England Patriots for a second round pick when he failed to rush for 1,000 in 2003. What did the Patriots get?? 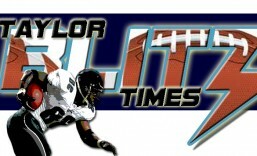 Try the driving force for their back to back championship season of 2004. He wasn’t just a member of that team. Dillon ran for a Patriots team record 1,635 yards and 13TDs & was the closer for the best of the three champions in their dynasty. He had 9 100 yard performances that year and the playoff clinching win came against Cincinnati. Where he received the game ball from Bill Belichick. The Patriots went on to win Super Bowl XXXIX 24-21 which validated the career of Corey Dillon. For his career he rushed for 11,241 yards and 82 TDs. Dillon is one of a select few to set the franchise record in rushing for multiple teams. As the argument heats up about the candidacy of other power runners like Eddie George and Jerome Bettis, neither showed the exhibition of power and speed Dillon displayed. Not to record breaking levels. He had 7 1,000 yard seasons and was a world champion. What could have become of Dillon’s career had he more talent around him?? One of history’s best power runners. 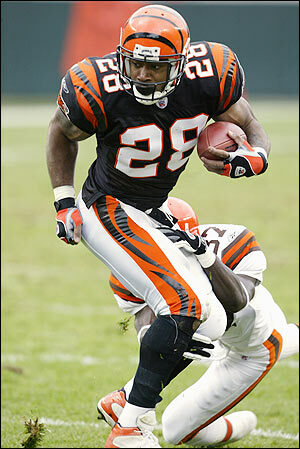 For induction into the Pro Football Hall of Fame, I present to you Corey Dillon.